Salesforce.com, Microsoft, Oracle, Sugar CRM and a plethora of other enterprises develop and deliver customer relationship management solutions to organizations of every ilk imaginable - from small waste management businesses to colossal retailers. Yet, that doesn't mean software companies release blanket solutions, or programs that can meet the needs of every organization. For example, there are some deployments that are applicable to health care organizations, but may not possess features that media sales professionals require. When a team of procurement officers is put in charge of purchasing a CRM solution, four steps must be taken before a software implementation is chosen. Before even selecting a provider, it's important for the procurement department to make a thorough assessment of how the company's sales and marketing teams operate. What metrics do these departments use to scrutinize performance? How could software allow them to perform their day-to-day responsibilities more efficiently? Surprisingly enough, this is where business culture comes into play. Corporate attitude and atmosphere can have a huge impact on the way salespeople and marketers represent their employers. For instance, if a marketing team delivers blogs, videos and other content on a regular basis, finding a CRM with an application programming interface that allows the solution to communicate with the content management system will greatly help professionals measure the performance of their material. Unifying transactions across multiple systems is a must, regardless of the industry an organization participates in. This level of operability can also help managers keep their subordinates accountable for specific tasks and responsibilities. While two companies may be similar, they are not one and the same. With each organization comes a different set of protocols, processes and an overall different way of doing business. 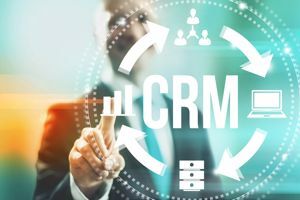 Customizing a CRM may not seem like the highest consideration a procurement professional must pay attention to, but it's not uncommon for end users to request particular functions or tools that cannot be found in the bare-bones deployment. Just to clarify - tailoring a CRM solution to the needs of an enterprise doesn't entail making sweeping changes to the software. Adjustments may be minor or added over time as the needs of end users change on a daily basis. As every purchasing management officer knows, interviewing those who have worked with a product for some time before considering buying said item is absolutely necessary. Obviously, this doesn't entail visiting a CRM developer's website and downloading a few case studies. While a software company won't explicitly lie to potential customers, it may embellish positive facts and disregard any hiccups end users encountered during implementation. This is where networking comes into play. Reach out to sales and marketing professionals through LinkedIn or within your own personal network and interview those who have used CRM solutions. Do they recommend a certain provider? Have they encountered any problems with their applications? If so, what are those issues? After these considerations are assessed, procurement professionals should identify whether on-premise or cloud-based systems are best for their companies. The choice largely depends on how often employees work remotely and how large current operations are.